Blouson is short, a cap with colored trim, bloomers on an elastic band..
Women's tunic, long sleeve, wide trousers, hood.. The cook of the chef is female, the apron of the cook is tricolor, the chef's cap,.. Jacket, stand collar, sleeve 3/4 with lapel, color edging, apron with bib, trousers on elastic without pockets, cap "Saule" on elastic with visor..
Double-breasted jacket, long sleeve, collar stand, medium-length apron, trousers on elastic band, headpiece tablet.. 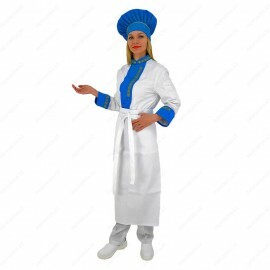 Chef's chef's jacket, long cook's apron, chef's cap.. Jacket long sleeve, trousers, beret, raincoat-tent..
Long sleeve jacket, wide trousers, apron with bib, cap..
Double-breasted jacket, apron short, hat, cap..
Apron baby with breastplate, children's armlets, beret.. Doctor's bathrobe, long single-breasted sleeve with buttons, tablet..